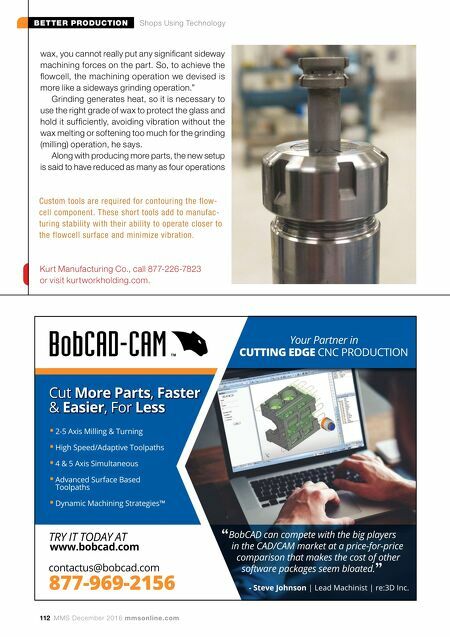 BETTER PRODUCTION Shops Using Technology mmsonline.com December 2016 MMS 113 on certain flow designs. It is important to note that Idex's flowcells have one- and sometimes two-sided machining requirements. 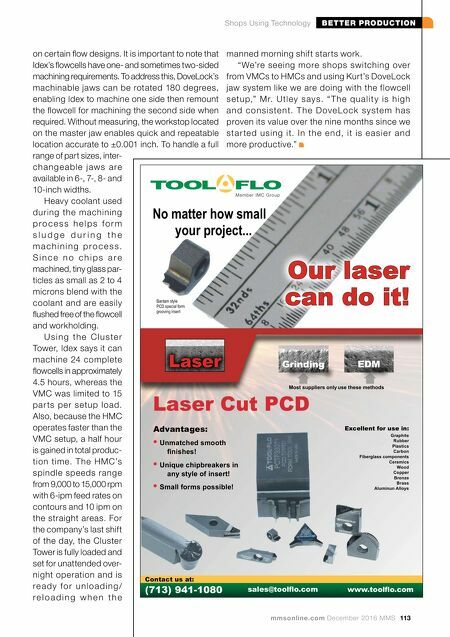 To address this, DoveLock's machinable jaws can be rotated 180 degrees, enabling Idex to machine one side then remount the flowcell for machining the second side when required. Without measuring, the workstop located on the master jaw enables quick and repeatable location accurate to ±0.001 inch. To handle a full range of part sizes, inter- c h a n g e a b l e j aw s a re available in 6-, 7-, 8- and 10-inch widths. Heavy coolant used during the machining p r o c e s s h e l p s f o r m s l u d g e d u r i n g t h e m a c h i n i n g p r o c e s s . S i n c e n o c h i p s a r e machined, tiny glass par- ticles as small as 2 to 4 microns blend with the coolant and are easily flushed free of the flowcell and workholding. U s i n g t h e C l u s t e r Tower, Idex says it can machine 24 complete flowcells in approximately 4.5 hours, whereas the VMC was limited to 15 par ts pe r setup load. Also, because the HMC operates faster than the VMC setup, a half hour is gained in total produc- tion time. T he HMC's spindle speeds range from 9,000 to 15,000 rpm with 6-ipm feed rates on contours and 10 ipm on the straight areas. For the company's last shift of the day, the Cluster Tower is fully loaded and set for unattended over- night operation and is r e a d y f o r u n l o a d i n g / r e l o a d i n g w h e n t h e Excellent for use in: Graphite Rubber Plastics Carbon Fiberglass components Ceramics Wood Copper Bronze Brass Aluminun Alloys Laser Cut PCD sales@toolflo.com www.toolflo.com Contact us at: (713) 941-1080 No matter how small your project... Our laser can do it! Bantam style PCD special form grooving insert Advantages: • Unmatched smooth finishes! • Unique chipbreakers in any style of insert! • Small forms possible! manned morning shift starts work. " We're seeing more shops switching over from VMCs to HMCs and using Kurt's DoveLock jaw system like we are doing with the flowcell s e tu p," M r. U tl ey s ay s. " T h e q u a l i t y i s h i g h a n d c o n s i s te n t. T h e D ove Lo c k s y s te m h a s proven its value over the nine months since we s t a r te d u s i n g i t. I n th e e n d, i t i s e a s i e r a n d more productive."